Oy vey, stop your kvetching. 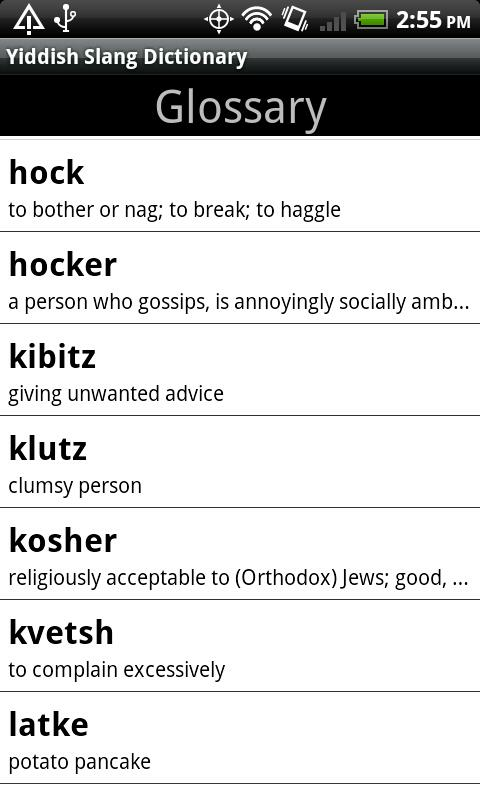 You've foundtheYiddish Slang Dictionary, to help you shmooze and kibitz. 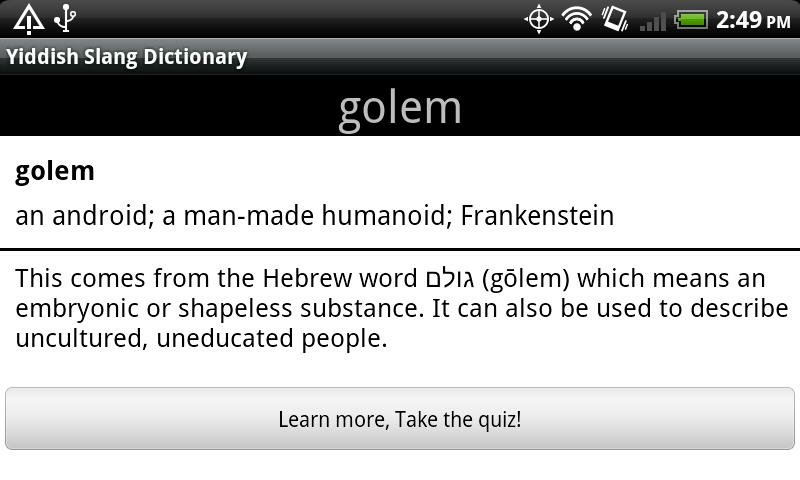 Bewarnedthough, this app contains some words not fit for yourbubbe. Polly Lingual is a multi-faceted learning platform for studyingforeign languages. We understand acquiring a foreign language is acomplex task, with different learning techniques suited fordifferent parts of the experience. Our interactive lessons providestudents with rote exercises to master foundational vocabulary andgrammar, while Polly Ambassadors bring students all the way tofluency through video tutoring. The interactive lessons use avariety of proven algorithms to make learning efficient andengaging. To gain access to all the lessons and advanced featuresrequires a Polly Passport, our all inclusive subscription model.Polly Ambassadors are available for private video sessions to helpstudent with pronunciation, practice conversation, learn localdialects, and more. Videos sessions are sold separately, or by 5-and 10-session bundles, depending on the Ambassador. SomeAmbassadors even offer 30-minute trial lessons. Très Bien French is the award winning app thatmakes learning French easy and fun!• Contains 75 lessons based on real life situations• High-quality audio by native speakers.• Adaptive quizing algorithm for efficiency• Keep track of your progress• Use without an Internet connection• Phrasebook for quick reference• No hidden purchases or ads!Lessons include:- Greetings- Social Ettiquette- How Are You?- Meeting People- Subject Pronouns- Talking About Languages- Family- Family (Relatives)- Describing People- Colors- Colors II- Numbers (0-10)- Numbers (11-19)- Numbers (20-100)- Numbers (100-1,000,000)- Ordinal Numbers- Days of the Week- Months and Seasons- Telling Time- How Old Are You?- The Human Body- The Human Body II- Face- Hand- Animals (Mammals)- Animals (Others)- Clothing- Clothes (Accessories)- Prepositions- Grammar Terms- Idiomatic Verb Phrases- Idiomatic Prepositional Phrases- False Friends- Fruits and Vegetables- Food- Ordering at a Restaurant- Ordering in a Restaurant II- Weather and Climate- At the Airport- At the Hotel- Travel and Transportation- Directions- Going Shopping- Going Shopping II- Tourism- Let's Go to the Beach- Emergencies- Emergencies II- Health and Medical- At the Post Office- Nationalities- Countries- Sports- Love and Romance- School- Business I- Business II- Banking and Finance- At the Office- Jobs and Professions- Jobs and Professions II- News and Politics- Computers and Internet- Tools and Fixing the House- Cleaning House- In the Bathroom- In the Kitchen- In the Bedroom- In the Living Room- Entertainment- Maternity and Baby- Internal Organs- Diseases and Conditions- Medications and Treatments- ReligionTry comparing us with Rosette Stone or Busuu. We're sure you'llfind us a more affordable and enjoyable experience. Wie Geht's German is the award winning appthat makes learning German easy and fun!• Contains 63 lessons based on real life situations• High-quality audio by native speakers.• Adaptive quizing algorithm for efficiency• Keep track of your progress• Use without an Internet connection• Phrasebook for quick reference• No hidden purchases or ads!Lessons include:- Greetings- Meetings People- Talking About Languages- Numbers (0-10)- Numbers (11-19)- Numbers (20-100)- Numbers (100-1,000,000)- Ordinal Numbers- Colors I- Colors II- Days of the Week- Months and Seasons- Telling Time- Family- Extended Family- Descibing People- The Face- The Hand- Human Body- Human Body II- Subject Pronouns- Grammar Terms- Animals (Mammals)- Animals (Other)- Clothes I- Clothes (Accessories)- Prepositions- False Friends- Ordering in a Restaurant- Fruits and Vegetables- Food- Weather and Climate- At the Airport- At the Hotel- School- Travel and Transportation- Directions- Going Shopping I- Going Shopping II- Emergencies I- Emergencies II- Health and Medical- Let's Go to the Beach- Sightseeing- At the Post Office- Nationalities- Countries- At the Office- Business I- Business II- Banking and Finance- Love and Romance- Internal Organs- Medications- Treatments- Diseases and Conditions- Jobs and Professions I- Jobs and Professions II- Sports- Computers and Internet- Entertainment- News and Politics- ReligionTry comparing us with Rosette Stone or Busuu. We're sure you'llfind us a more affordable and enjoyable experience. Porteño Spanish is the dialect of caste-sha-no(castellano) spoken in Buenos Aires, Argentina and the surroundingareas. It is categorized by an Italian-like pronunciation andcolorful Lunfardo slang. ¡Órale! Learn the Mexican slang needed to speak like a Chilangoverdadero. Warning: The vocabulary on this site is notabuela-friendly! Idioms and Slang Dictionary by Farlex gives you definitions andexamples from top sources like McGraw-Hill and Houghton Mifflin formore than 66,000 terms, including: Idioms Slang terms Phrasal VerbsAbbreviations Proverbs Clichés Regionalisms ColloquialismsExpressions Sayings and more! Get clear, in-depth definitions oftens of thousands of idioms used in the US and throughout theEnglish-speaking world. You say them every day, but do you knowwhere they come from? Get the history behind the phrase. PLUS seeidioms explained in animated videos! FEATURES * Search by keywordor full phrase and always find what you're looking for. * Watchexclusive animated idioms videos with illustrated definitions andexample sentences. * View multiple example sentences to see how anidiom is used in everyday speech. * Get the history behind thephrase. Find out when and where an idiom originated. * Use nativevoice search to look up a word or phrase just by saying it. (Withsupported devices) * Learning English? To sound like a nativespeaker, you need to know idioms! Master conversational Englishwith this free resource. * Add unlimited bookmarks and build yourvocabulary. * View your recent searches. * See search suggestionsas you type. * Perform advanced searches, including "Starts with,""Ends with," "Contains," and "Wildcard." * Share your favoritephrases via social networks, email, and text. (With supporteddevices) * This is NOT a preview or a trial version, and there isno "locked" content. Open the app and immediately access allcontent, no subscriptions required! * User-friendly, comprehensive,and authoritative: the perfect free Idioms and Slang Dictionary fornew English speakers or anyone curious about the English language!Here's a sneak-peak of what you'll find inside: let the cat out ofthe bag Give away a secret, as in "Mom let the cat out of the bagand told us Karen was engaged." This expression alludes to thedishonest practice of a merchant substituting a worthless cat for avaluable pig, which is discovered only when the buyer gets home andopens the bag. [Mid-1700s] silver lining An element of hope or aredeeming quality in an otherwise bad situation, as in "The rallyhad a disappointing turnout, but the silver lining was that thosewho came pledged a great deal of money." This metaphoric term is ashortening of "Every cloud has a silver lining," in turn derivedfrom John Milton's Comus (1634): "A sable cloud turns forth itssilver lining on the night." a picture is worth a thousand words Agraphic illustration conveys a stronger message than words, as in"The book jacket is a big selling point—one picture is worth athousand words." This saying was invented by an advertisingexecutive, Fred R. Barnard. To promote his agency's ads he took outan ad in Printer's Ink in 1921 with the headline "One Look Is Wortha Thousand Words" and attributed it to an ancient Japanesephilosopher. Six years later he changed it to "Chinese Proverb: OnePicture Is Worth Ten Thousand Words," illustrated with some Chinesecharacters. The attribution in both was invented; Barnard simplybelieved an Asian origin would give it more credibility. Downloadnow for free and get instant access to content you won't findanywhere else! How do we do it? TheFreeDictionary.com - Farlex appshave been downloaded tens of millions times across multipleplatforms, with top ratings after hundreds of thousands of reviews.We work with the best publishers to bring together trusted contentin the most comprehensive, authoritative dictionary apps on themarket. Our flagship app is The Free Dictionary (TFD), powered byTheFreeDictionary.com. Find our other apps by searching "Dictionaryby Farlex" in Google Play. Read "The Slang DictionaryEtymological, Historical and Andecdotal"by John Camden Hotten!Once you install this app, you can read it by1-click without connecting network.You can also check your "ReadingScore" from the menu. American Slang is the ultimate androidapplication to understand Americans when they talk and also to talklike a native speaker.Stay tuned !! Do you know the meaning of"KK","/W","DIKY","WBU","(Y)",":$",":&",":D",":D:D",">:(","<3","<333"when you chat with your friends?If not,then this is best app foryou, having thousands of slang and short form to make your chattingdifferent.You have more options to impress your friends with weirdslang words.This app includes search button for frequentsearch,each word arranged alphabetically.Internet Slang Dictionaryis an application containing over 9000 slang and short formfrequently used on the Net.It is an excellent App for everyone whois new to Internet chatting or keen to know more about the weirdwords used by your friends.Learn the internet slang words and earnslang knowledge. Internet slang (Internet shorthand, Cyber-slang, netspeak, orchatspeak) refers to a variety of slang languages used by differentpeople on the Internet. It is difficult to provide a standardizeddefinition of Internet slang due to the constant changes made toits nature. However, it can be understood to be a type of slangthat Internet users have popularized, and in many cases, havecoined. Many people use the same abbreviations in texting andinstant messaging, and social networking websites.On thisApplication you will find a list of slang terms, acronyms andabbreviations as used in websites, on Twitter, ICQ chat rooms,blogs, SMS, and Internet forums - a complete dictionary of slang. 'Char Slang Dic' is an app for understanding of the meaning ofacronyms, abbreviations, slang terms in online chat, SMS, onlinegame and other online activities.You can copy the slang and textemoticon to clipboard and use it for online chat, SMS, SNS andothers. - Today random slang menu. - Slang search and list menu. -Emoticon list menu. Bahasa Slang adalah bahasa Gaul Kekiniandanbukan berarti bahasa para fans slank atau slankers.Aplikasi Kamus Slang merupakan aplikasi gratis yang bisadigunakansecara offline tanpa perlu paket data internet.Sebagai sarana belajar Bahasa Slang untuk pergaulan di sekolahataudi kampus maka perlu menggunakan aplikasi kamus Slangini.Kamus Slang bisa disebut juga Kamus Gaul, Kamus Prokem,KamusKekinian.Terimakasih, ditunggu Rating bintang 5 dan sumpah-serapahdarianda untuk aplikasi Kamus Slang ini.Slang language isthelanguage of Gaul Present and are not necessarily the languageofslang or Slankers fans.Slang Dictionary application is a free application that can beusedoffline without Internet data packets.As a means of learning English slang for socially at school orincollege it is necessary to use this applicationSlangdictionary.Dictionary of Slang Dictionary can be called Gaul,Prokemdictionaries, dictionaries Present.Thank you, wait Rating 5 and curses of yourapplication'sDictionary of Slang.